Preheat an outdoor grill to medium-high heat (approximately 375 degrees) or preheat oven to 375 degrees. Combine first 11 ingredients in a bowl. Add the ground chicken and mix well. Brush the meatball griller with canola oil. Form into 12 jumbo-sized meatballs and place in the wells of the griller. Place meatball griller on the grill or in the oven. Cook for 15-18 minutes or until a meat thermometer inserted in the center registers 165 degrees. While the meatballs are cooking, combine sauce ingredients in a saucepan. Bring to a simmer and cook 10-12 minutes or until heated through. 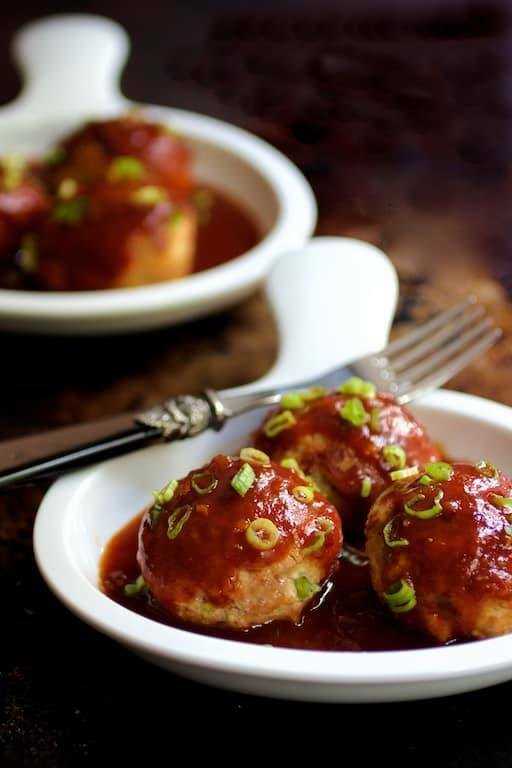 Serve sauce over meatballs. Garnish with sliced scallions.